Welcome to Feathercraft's new blog site. 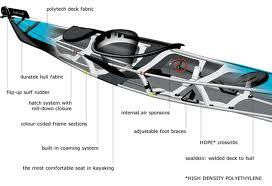 Feathercraft is Canada's leading designer and manufacturer of folding kayaks. Our kayaks are based on an ancient skin design. We have replaced animal hides with urethane fabrics, welded together to create a seamless skin composed of a deck and hull layer. Our aluminum frames are ultralight and are made of the same alloy utilized in airline construction. Buoyancy is achieved with the help of sponson chambers that run along the inside of the frame. Each kayak that we design folds up and fits in a backpack that can be stored easily in the closet of any home. These unique boats are all handmade by the skilled staff at our factory on Granville Island, in Vancouver, British Columbia. We hope you enjoy reading our posts.